Most of the products Apple announced at WWDC won’t ship until later this year, but the new MacBook Air models are here. The MacBook Air didn’t undergo a dramatic, Mac Pro-like redesign—all of the changes to the MacBook Air are hidden under the hood. Even compared to last year’s MacBook Air—which brought Thunderbolt and USB 3.0—this new Air is more evolutionary than revolutionary. The biggest change in this iteration of Apple’s most portable of portables is the inclusion of Intel’s latest generation of Core processors, code named Haswell. These fourth-generation Core processors replace the Ivy Bridge processors in last year’s MacBook Air. The Haswell processors require less power than Ivy Bridge, which improves battery life in portable computers like the MacBook Air. Haswell also includes new integrated graphics in the form of the Intel HD Graphics 5000, which Apple says provides 40 percent higher performance than the HD Graphics 4000 used in Ivy Bridge processors. The new MacBook Airs all support the new 802.11ac wireless networking standard, and the flash storage has also been improved, with higher capacities on the 11-inch models and faster performance across the line. Apple offers four standard configurations of the new MacBook Airs, two with 11-inch displays and two using 13-inch displays. All four have the same dual-core 1.3GHz Core i5 processor, capable of reaching speeds of up to 2.6GHz with Turbo Boost and can act as a virtual quad-core processor thanks to Hyper-Threading. All four have the aforementioned Intel HD Graphics 5000 and 4GB of 1600MHz LPDDR memory, which cannot be upgraded. The difference between the two models of each screen size is the capacity of the solid state storage. The 11-inch MacBook Airs come with either 128GB of flash storage for $999 or 256GB of flash storage for $1199. The 13-inch models also come with the same 128GB and 256GB capacities for $1099 and $1299, respectively. With cloud storage options gaining popularity and features, some people will have no problem fitting their necessary onboard data within the 128GB capacity of the two lower-end models. Others, like me, prefer having more of their songs, movies, files, and photos accessible offline and prefer having the most capacity possible. Luckily, Apple offers optional upgrades at the time of purchase that double the flash storage capacity to 512GB for a pricey $300, and double the amount of RAM to 8GB for $100. While 4GB of memory is probably plenty for general computing needs, I’d still recommend the 8GB RAM option, especially as the RAM is not user upgradable. Apple’s other non-upgradable Macs, like the Retina MacBook Pro and 21.5-inch iMacs have 8GB of RAM standard. For an extra $150, Apple will swap out the dual-core 1.3GHz Core i5 processor for a dual-core 1.7GHz Core i7 with Hyper Threading and with Turbo Boost speeds of up to 3.3GHz. 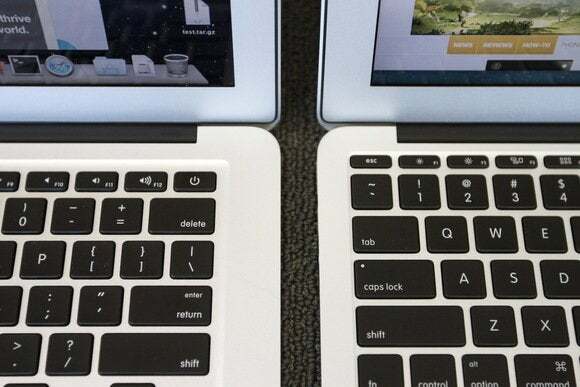 The only external clues to differentiate between the 2013 MacBook Air and the 2012 editions are the two tiny holes located near the audio port that are used for the new Air’s two microphones. Previous Airs had just one microphone. The second microphone is used to help with noise cancellation and to improve sound quality. The new MacBook Airs use the same glossy, LED backlit displays as the 2012 models and at the same respective resolutions—they're not Retina displays, as was anticipated by some in the rumor mill. The 11.6-inch Air has an 1366 by 768 pixel resolution screen, and the 13.3-inch Air has 1440 by 900 pixel resolution. All MacBook Airs have one Thunderbolt port for adding monitors and/or external storage, and two USB 3.0 ports, one on each side. The laptops also have MagSafe 2 power connectors and an audio-out jack for headphones. All Airs have 720p FaceTime cameras and built-in speakers. The 13-inch models include a handy SDXC card slot. The 11-inch model weighs 2.4 pounds while the 13-inch weighs 3 pounds. 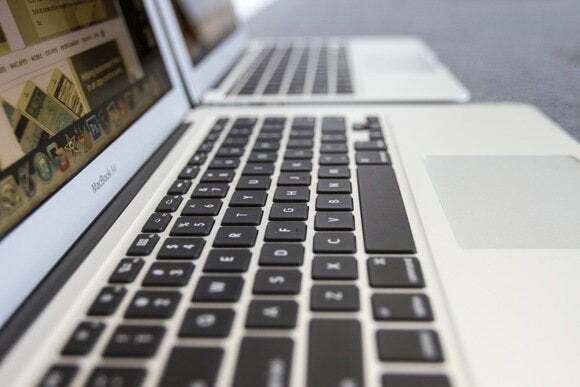 With all four MacBook Airs sharing so many of the same specifications, it should surprise no one that the 256GB 11-inch MacBook Air and 128GB 13-inch MacBook Air we tested performed almost identically. Comparing the results from the 2013 systems to the 2012 MacBook Air results, we found that the HD Graphics 5000 outperformed the HD Graphics 4000 by as much as 24 percent on the 11-inch models and 30 percent on the 13-inch MacBook Airs. The new, faster flash storage in the 2013 models also helped the new models best their predecessors in our 6GB file copy tests by 28 percent on the 13-inch laptop and a very impressive 50 percent on the 11-inch Air. Faster flash also helps to reduce startup times; the new 13-inch Air took around 14 seconds to start up, versus 18 seconds for last year’s model. The Haswell processors in these new MacBook Airs are running at a slower clock speed than the Ivy Bridge processors in the 2012 models. The 2012 13-inch, 1.8GHz Ivy Bridge MacBook Air was faster than this year’s 13-inch, 1.3GHz Haswell MacBook Air in 8 of our 14 tests, including folder compression, iMovie, iPhoto, Photoshop, Aperture and MathematicaMark 7 tests. The faster graphics and faster flash storage in the newer MacBook Air was enough to result in the two generations earning identical Speedmark 8 scores. One of the key benefits of the new Haswell processors is reduced power consumption and, therefore, longer battery life. Apple claims up to 9 hours for the 11-inch model and up to 12 hours on the 13-inch compared to 5 and 7 hours previously. Our battery test results show that the new MacBook Air has the best battery life we've seen from an Apple laptop. Read more about the new MacBook Air's battery life and our test results. For a more detailed breakdown of our 2013 MacBook Air performance testing, check out our previously published benchmark story. The new MacBook Air has a lot in common with its predecessor in terms of features and look and feel. While the improvements are mostly subtle, they succeed in making an already excellent product even more desirable. Under the hood improvements to the integrated graphics and flash storage help boost performance, while improvements found in the new Haswell processors help to improve battery life. Some may find the 128GB of the lower-priced system confining and I’d recommend the upgrade to 8GB of RAM for all users. While the MacBook Air improvements are mostly subtle, they succeed in making an already excellent product even more desirable.